In approximately four hours, I’ll be leaving on a long road trip to drive my Aston Martin into the Maine wilderness on its longest, most grueling road trip yet. This will be a momentous occasion, as I do not believe my Aston Martin has ever personally met a moose. It will also be a serious, highly important test of the Aston’s endurance capabilities for two reasons. The other crucial point that’s making this trip especially exciting is that I will be doing it with my fiancé. Now, on the last two trips, I was by myself—so if I had broken down, I would’ve just giggled about it, and posted a couple photos to Facebook and Instagram, and I would’ve moved on with a nice story to tell. On this trip, if I break down, there will be no giggling. There will only be pure, unadulterated, visceral abhorrence at the Aston Martin’s decision to ruin our summer vacation. 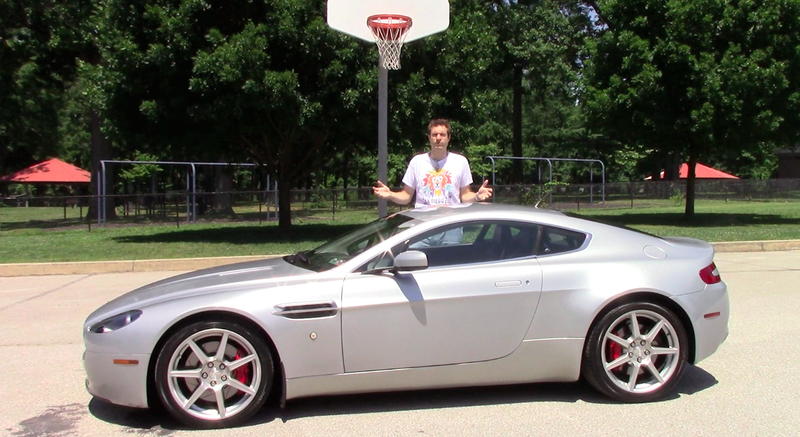 Of course, regular readers will remember my last two Aston Martin road trips. In the first one, I drove from Philadelphia up to Vermont for a weekend so I could drive the Aston on an ice lake. This was cool, but it wasn’t incredibly challenging, as it was only 800 miles and it was only for a weekend. Then, there was the drive to Charleston, South Carolina. This was an impressively long trip, but it wasn’t exactly like I was going into the wilderness in the middle of nowhere. I mean, Charleston has a Whole Foods. On this trip, I will be going into the wilderness in the middle of nowhere. Now, if you live out west, I know what you’re thinking: Maine is not the wilderness. Montana is the wilderness. Maine is a place where they design and manufacture lobsters. Well, you’re wrong, and I’ll give you an example of just how wrong you are: not long ago, a woman wandered just a few yards off the Appalachian Trail in Maine to pee. She got so disoriented and lost in the thick wilderness that it took them three years to find her body. For further proof: Maine is so full of dense forest that the primary design feature on its license plate isn’t a beautiful city skyline, or an idyllic image of the beach, or a likeness of a famous resident, but rather a pine cone. I am completely serious. So yeah, I think it’ll be fun! When this trip is over—assuming it goes smoothly—my Aston will have seen 14 states and the District of Columbia. Given that the trip will cover around 1,400 miles, it also means I will have put about 8,000 miles on it during my first seven months of ownership. So anyway: be sure to follow along with this road trip on Twitter or on Facebook, so that you can see what it’s like to drive an Aston Martin into the pure, unchecked, wilderness. And if you do not wish to follow along, never fear! I have convinced my fiancé to help me record a video to document the experience along the way. A video that will capture either the excitement and relaxation of a wonderful vacation, or the pure, unadulterated, visceral abhorrence. I personally cannot wait to find out which. @DougDeMuro is the author of Bumper to Bumper and Plays With Cars, which his mother says are “fairly decent.” He worked as a manager for Porsche Cars North America before quitting to become a writer.